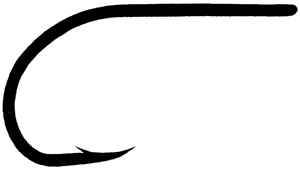 This “improved” O’Shaughnessy hook features a short shank and a curved “beak” point (see 2451) and it is offset (reversed). The short shank equates to less leverage as a large fish bites down on the hook shank. The offset is a popular technique used to increase hook-ups and many saltwater anglers prefer the curved point claiming better hook-ups.